Apple updated its Apple Pay participating issuers list today with 35 additional banks, credit unions and financial institutions supporting the contactless payment service in the United States. Apple Pay now has over 375 participating issuers nationwide, and dozens more plan to support the NFC-based mobile payment service in the future. The newly added Apple Pay participating issuers are reflected below, although it's worth noting that some banks, credit unions and financial institutions listed may have already had support for the contactless payments service and are only now being reflected on Apple's website. Apple Pay is accepted at nearly 750,000 locations in the United States and United Kingdom, and Apple is committed to an international rollout of the mobile payments service in additional countries such as Canada and China in the near future. Canada could be the next country to embrace the service outside of the U.S. and U.K. in November. The country has already migrated to Chip-and-PIN debit and credit cards and many retailers and businesses have since upgraded to NFC-based terminals to accept contactless payments. Now, to get more retailers to accept it. Just to break this down, that works out to be 749,500 locations in the UK and 500 in the US. In reality 498 of the US locations have actually turned off their terminals so really only two places accept it in the US -- WholeFoods and McDonalds. The irony is perfect. Notwithstanding your humor, I've used it multiple places besides McD and WF, including gas stations, Walgreens, Pandora Jewelry, and anywhere that has one of the logo, I try it, and so far, I'm at 100% in the Seattle area. 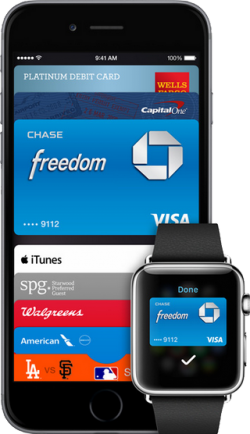 This is fantastic, I can now load up my iphone/applewatch with the 1000 credit cards that I have and ditch my wallet. Of course the only problem is that this is completely useless until merchants agree to turn on their NFC terminals to accept touchless payments. So far this whole thing has been lopsided towards the issuers. I hope that this corrects itself soon. It seems small what the benefits are to the consumer, but having used it several times in the 2 places that accept it on the planet (okay I may be over dramatizing it a little here but the point stands :)), I have found that the the peace of mind from the superior security of the transaction coupled with the sheer convenience really does make a difference. I am anxiously awaiting for this to role out and if merchants trade their current square fobs for apple pay fobs this will be totally awesome. Can't wait for this in Canada. Though I'll need to purchase an iPhone 6s or Apple Watch if I want to use it. Will definitely get one of the two once Apple Pay rolls out. 1. I use a PayPal debit card. PayPal is not on board yet. 2. Just about everywhere that has an NFC logo and several that even have Apple logos come back with "Apple Pay has been disabled." It's more of a hassle trying to use it so far. 1. More issuers means more demand for the use of contactless systems. Also, the tipping point is coming this summer. In October, 2015, the risk is on the retailer for fraud if they do not take chip and PIN cards (like a lot of the world has). The ingenuity of Steve Jobs that led to this. Apple being involved as a participant among millions upon millions of transactions. Where I live Apple Pay still isn't accepted at the grocery and home improvement stores I frequent. The campus I work at has added support to many of their terminals this summer. It's really convenient (and especially fast on the Watch) and I can't wait for more locations to support it. What I really can't wait for are restaurants to support it. It seems so archaic to hand them your card and they go to some back area to run it. Sure, here's my card number, expiration date, and CCV code. Just take it all to the back! Dumb. My worry is that places will up pushing Android Pay instead because Google will likely hand over all transaction information to the retailer. They'll probably also provide your complete Google advertising profile for a fee! "This guy keeps his Nest thermostat set pretty low. He must get hot easily. We should market ice cream at him every time he comes into the store, tries to browse the web, or through email and social media!" Meanwhile the real reason I'm hot is because I've been working out a ton, building stuff on my house, trying to get into better shape. But then there's just ice cream everywhere tempting me to stay chunky. Just a hypothetical glimpse at the future. Hopefully it's not that bad! Unfortunately I see this as tame compared to what they could do. I got an advertising minor just a couple years ago along with my design degree and that's the kind of crap they talked about in class. Just wait.